Small - $44.99 Only 9 left! Medium - $44.99 Only 9 left! NOTE: This helmet is not intended to be worn as protection when actually playing football or any other contact sport. Wow! You must be VERY proud. For reference, our kid’s first word was “Bah-bah” and we don’t really know who he meant but we assume he meant “Dad.” So that fight song verse is really quite a feat. While he may not be old enough to remember watching the Game of the Century (and maybe you aren't, either), he can proudly wear the crimson and cream with this Oklahoma Sooners Child Uniform. You can customize the jersey with his favorite player's number, using the iron-on numbers included with the outfit. 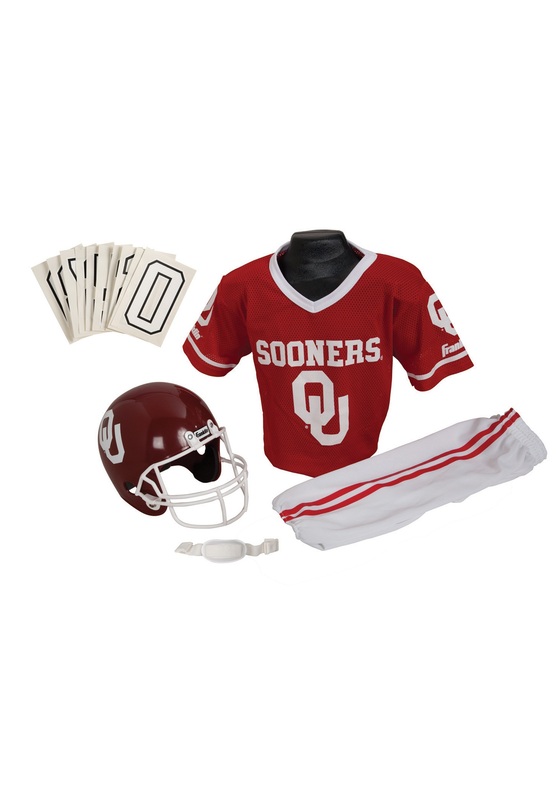 This replica OU football uniform is so cute, you’ll have a hard time keeping Halloween’s trick-or-treating from becoming a full on pep rally. But, he can wear it again and again for watch parties on the couch or--squeal!--his many visits to Owen Field! This football uniform offers up everything but the padding, including a helmet with chin strap, white pants, and the crimson jersey! The helmet is not actually regulation for play, so don’t let your kiddo huddle up in it just yet. But that’s OK, because this uniform is too cute and sacred to actually get dirty. Boomer Sooner!